This entry was posted in Academic achievements, Students and tagged Rhodes Scholar on November 4, 2013 by Wire Eagle. AUBURN UNIVERSITY – Auburn University senior Patrick Donnan and 2012 graduate Ashton Richardson have been named finalists for the prestigious Rhodes Scholarship for an opportunity to study at the University of Oxford in the United Kingdom. If selected, they would be among only 32 U.S. students to receive the honor. Donnan will interview in Birmingham as part of Rhodes District 7, while Richardson, now a veterinary student at Texas A&M University, will interview in Houston as part of District 8. The interviews will take place Nov. 22-23. Approximately 1,000 students are endorsed annually for the scholarship by their respective universities, with 200 being named finalists. The criteria include high academic achievement, integrity of character, a spirit of unselfishness, respect for others, potential for leadership and physical vigor. Donnan and Richardson are Auburn’s sixth and seventh Rhodes Scholar finalists since 2009, including Jordan Anderson who was named a Rhodes Scholar that year. Richardson was also a finalist last year while at Auburn and was re-nominated by Auburn this year. 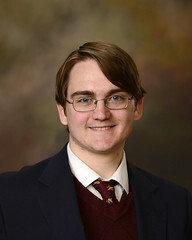 Auburn native Donnan, who has a 3.98 grade-point average, is a student in the Honors College double-majoring in physics and music, concentrating on the bassoon, and minoring in mathematics. He is also a 2013 Barry M. Goldwater Scholar and was recently named a finalist for the highly selective Marshall Scholarship. He conducts research in the College of Sciences and Mathematics as a member of the theoretical and computational atomic physics group. He is an editor of the Auburn University Journal of Undergraduate Studies and has co-authored four peer-reviewed publications, including articles in Nature: The International Weekly Journal of Science. Upon graduation from Auburn in 2014, he aims to complete a doctorate in theoretical atomic physics and ultimately become a physics professor. If awarded the Rhodes, Patrick will work with faculty at the Center for Quantum Computation at Oxford. 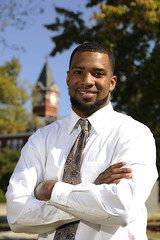 Richardson, a former linebacker on the Auburn Tigers football team, majored in animal sciences with a concentration in pre-veterinary medicine in Auburn’s College of Agriculture, earning a grade-point average of 3.94. He was a four-time SEC Academic Honor Roll honoree and winner of the 2012 Bobby Bowden Award, presented by the Fellowship of Christian Athletes to the NCAA Division I Football Bowl Subdivision player who best epitomizes a student-athlete. A native of New Orleans, he grew up helping his father raise quarter horses and has aspirations to become an equine surgeon. He wrote his Honors College thesis under the direction of Reid Hanson, professor of equine surgery in Auburn’s College of Veterinary Medicine. Outside the classroom, Richardson volunteered for four years as a mentor at the Lee County Youth Development Center. The Rhodes Scholarships, founded in 1904, are the oldest international fellowships and are administered by the Rhodes Trust, a British charity established to honor the will and bequest of Cecil J. Rhodes.